First off, sorry to hear that, John! Perhaps it’s even time for a Nest Protect? But I digress, let’s answer the question proposed in his newsletter. Rather than shooting over a comment, I thought it was a good time to write down my backup strategy for the home lab into blog format. I use a four step approach to protecting files in the lab. The primary storage array is an ioSafe 1513+, written about here. It has 5 disk drives with 4x 1 GbE connections running the latest DSM (version 5.2 as of this post) with NFS and SMB enabled. Every night, the native Synology Backup & Replication kicks off a Shared Folder Sync job to mirror the shares found on Volume 1 to the secondary storage array. My secondary storage array is an older Synology DS411 which used to be my only storage when I started the lab and has undergone some upgrades. It has 4 disk drives with a single GbE connection and also runs the latest version of DSM with NFS and SMB enabled. There are no client sessions attached to the storage, but it’s always online in case the primary fails and I need to grab a file. 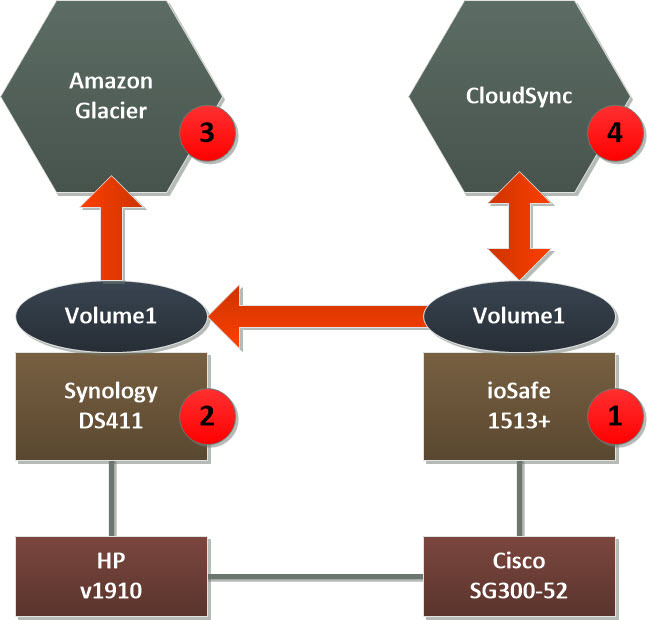 After receiving a Shared Folder Sync from the primary storage, all data on the secondary storage is uploaded to Amazon Glacier. This gives me a roughly 24 hour RPO for cheap, off-site storage. For collaborative data, I use Synology Cloud Sync to shuttle data in and out of the ioSafe using a bidirectional sync. This avoids needing to drop clients on my desktops, and also serves as a near-zero RPO for a few critical projects. I use Google Drive, Dropbox, and OneDrive. Karl, I totally concur with you. Automatically backing up offsite to either the “cloud” or another device else where if you can get good speeds is great for DR/BR. For most home users, we really are dependant on our ISP speeds. I am currently living in Australia and my upload speed is 0.15Mbps, which is an absolute shame, can’t do much with that speed. I too have a Synology, 1513+ and it’s a great device, backing up to a secondary unit and then off to something like Glazier would be great, but the latter I cannot do and thus, not mitigating my risks unless I backup to disk and then take offsite just like you. Nevertheless, Chris thank you for this article, good to hear about your setup and how you manage this. Im running a smaller version of Chris’s but have the same issus as Karl. right now my primary storage is a 1815+, and have it sync to a 1513+. all my critical data is then sync’d to one drive. so bascily my critical stuff is aroun 30gb which is protected in thoery if somthing happens. the remaining 11tb is just duplicated to the 1513+. I did look into crashplan or backblaze but the cost to via seed drives or limited upload doesn’t make it viable to send that much data offiste. right now I just keep the 1513+ in my office and 1815+ in the server cage in the basement. may look at relocating to a buddies place. Thanks ! Do you have versionning for your Backups? It seems that the Shared folders backup can keep only the latest version.